After Building Cleaning Residential & Commercial Heathfield TW4 | Quality Property Care Ltd.
You can get in touch with us at any time of the day or night, just call 020 3746 4287 and our professional team will be more than happy to help you anyway they can. Our flexible booking allows for early morning and late evening cleaning slots, with availability during the bank holidays and weekends, without any additional charge. This is a service suitable for both industrial and domestic clean up jobs, as our professionals have both the equipment and the knowledge to accommodate the needs of both. The experts are able to clean the entire house or do as much as we can for the hours you have booked. Depending on the condition of the property, you decide how much we clean, we come prepared, we clean, you are left satisfied. The service itself covers every aspect of after building cleaning, from removing paint spots from window sills and door frames, to the deep clean of all skirting boards, waist coating, doors, fixtures, switches and sockets. We also e-scale and de-lime any kitchen or bathrooms tiles, as well as clean all woodwork and polish all surfaces if necessary. Along with that we perform deep-cleaning of living rooms, kitchens, bedrooms, and common areas including fixtures as well as cupboards outside and inside. We remove any rubbish and debris leftover from the construction work, professionally clean all windows, sills, and window frames from paint, leftover debris as well as plaster. In the service we can also include steam cleaning, wall washing, pressure washing, tile scrubbing, window cleaning, hard floor cleaning, wood, floor polishing, carpet and upholstery cleaning, driveway and patio cleaning, rubbish removal as well as night cleaning if you are so inclined. We can begin work only after the construction job has been totally completed, otherwise there will be interference from both teams. On the other hand we cannot guarantee the fine finish we usually leave if there is still construction going on. We use domestic and commercial equipment like vacs, scrubbers and pressure washers which allow us to get deep into the stain and remove it completely, without any hassle or damage. For domestic properties we have a special treatment method which de-limes and removes any surfaces that might have had paint on them. This removes all unpleasant residue, allowing our experts to properly remove any other dirt in the premise. For commercial properties and offices we can accommodate your cleaning needs, and work late at night or early in the morning in order to get your property up and ready for work once again. There are without extra fees for weekend cleaning, though you better check back with us at 020 3746 4287. Cleaning after builders comes as a big problem afterwards the constructions. That hard work you have already done has exhausted you enough. So, better take the benefits of using an effective, expert and risk-free after builders cleaning service in Heathfield TW4. Quality Property Care Ltd. after building cleaning company offers full customer support, quick reaction after your call - including possibility for emergency service - and even the chance for you to be out, while the purge is done. Leave the trained and experienced after builders cleaners some spare keys to do their job, while you are having rest somewhere out. 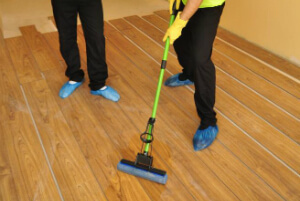 We can work only after construction work has completely ceased as any interference with our cleaning may lead to further contamination of the house and make the work harder. In terms of scheduling you can contact us, enjoy same day booking with minimal hours available, no strings attached, contracts and deposits required. Bath left shining, cleaned and rinsed, with shower recess scrubbed, all glasses and shower fittings cleaned, with special attention to the vanity and basin. Toilets are taken care of with proper scrubbing and disinfection including their base and around the outlet pipe and behind the tank, with a proper polish for all mirrors. We provide vacs for floor hoovering and mopping with an eye for the finer details like light power socket and switch cleaning. Tiles and fittings will be cleaned and left shining, waste bin cleaned from any paint and leftovers and left shining with additional attention to door frames bottom to top.